Following the mixed success with the initial deployment of gliders and drifters in mid-September, the Seaglider was re-deployed off Richards Bay on 5 October. This time the Agulhas Current took the glider downstream even faster, keeping it out beyond the continental shelf edge off central KZN. 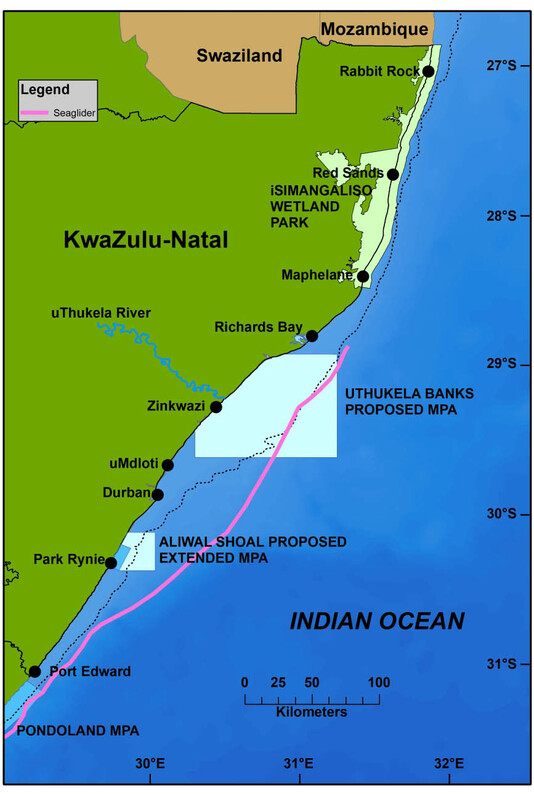 South of Park Rynie the glider came closer to the coast, associated with the narrow continental shelf off southern KZN and the Eastern Cape. 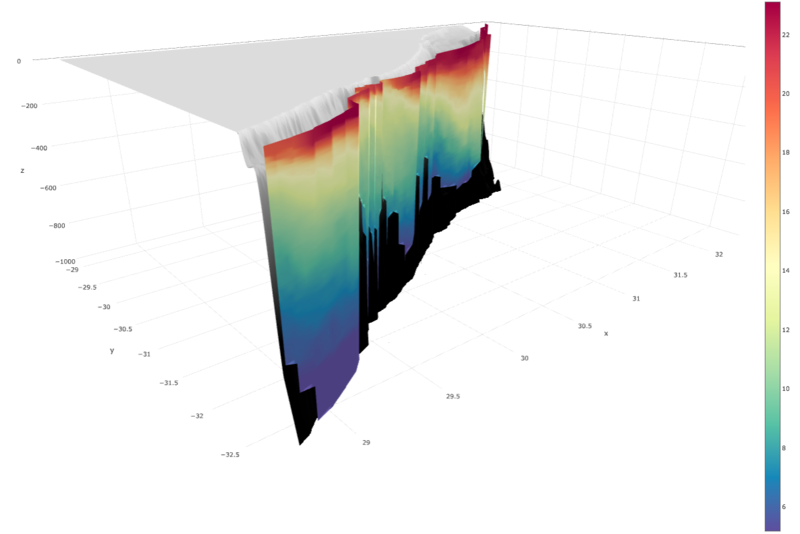 Luke Gregor from CSIR-SOCCO has produced this great 3-D plot of the sea temperature recorded by the glider on its dives between Richards Bay (top right) and East London (bottom left – its last reported position). The sea temperature oC is shown in the coloured bar on the right; latitude and longitude are shown on the X and Y axes respectively, with depth in metres on the Z axis. The grey area is the continental shelf – the steepness of the slope seaward of the shelf edge is obvious. Surface temperatures were around 22oC, dropping to a chilly 6oC on its deepest dive to around 1000m. The glider will be retrieved off East London, and will be serviced before going on its next mission – probably in the Southern Ocean, for another project. Glider and drifter deployments for the CAPTOR project are planned again for early next year, timed to coincide with coral spawning.